Full Company History + Fiber to the Home Project started almost 7 Years Ago! NortheastTels fiber to the home project started almost 7 years ago! 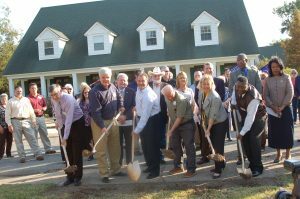 The exact ground breaking date (Image shown) was October 26th, 2010. Can you believe it? We certainly can’t. So we wanted to share our company history from the past 70 years. If you just want to read about the fiber project then scroll all the way to the bottom to the year 2010. Thank you for your love and support through the years! NortheastTel – Our History: How we got here! NortheastTel began serving customers in 1946 as Northeast Louisiana Telephone Company. As we look back over the history of our company, we find that many people and events helped shape who we are today. The Collinston exchange portion of NortheastTel was originally part of the Oak Ridge-Collinston Telephone Company owned by W. Clarke Williams in the 1930’s. The “Gum Swamp” area around Collinston was hard to serve. The area around Collinston was the last large section of Morehouse Parish to be settled. The area was heavily covered with timber and was a favorite place to hunt bear. The Collinston exchange was separated from the Oak Ridge exchange and sold to E.N. Gibbs who in turn sold it to Tom Linzay who operated under the name Collinston Telephone Company until 1946. In late 1946, Ben W. “Hop” Hopgood purchased the Collinston Telephone Company from Tom Linzay. Hop worked for the Missouri-Pacific Railroad at the time and later went to work for International Paper as a liaison between the railroad and IP. A magneto switchboard was used to process calls through an operator at the Linzay residence. Tom’s wife, Lula Mae and his children, Tommie Mae, Audrey Faye, David, and Shirley, operated the switchboard along with Hop’s wife Mary Elizabeth Rector Hopgood, and Dorothy Anne Norsworthy. Mary Elizabeth was the daughter of Dr. James M. Rector and Ida Robinson Rector. Dr. Rector had a medical practice in Collinston. Sometime in the early 1950’s the switchboard was moved to a back room in the Hopgood home on Main Street in Collinston. Mary Elizabeth Hopgood and Lillian Justice served as the switchboard operators at that time. Joyce Takewell and Dorothy Anne Norsworthy helped out between college school terms. Hop’s sister, Ethel Daniels, also assisted on the switchboard for a time while she lived with Hop and Mary Elizabeth. During this time, the switchboard was open for calls 24 hours per day and 7 days per week even if you had to wait for the operator to get out of bed to make the call. During 1952, the Bonita-Jones exchange which was also still using the old magneto switchboard system was purchased from Victor Watts. Victor’s wife, Doris, served as the telephone operator while they owned the system. At that time the Collinston Telephone Company became Northeast Louisiana Telephone Co., Inc. with Ben W “Hop” Hopgood and Alton Norsworthy serving as officers of the corporation. The Charles Bilbury family operated the switchboard for the Bonita-Jones exchange for several years. Faye and Lorrain Sims operated the Bonita-Jones exchange from 1952 until Mr. Sims retired in 1976. Bill Sims worked alongside Mr. Bilbury for several years and then with his father until going into the service in 1955. David Justice, Jr. was hired to help with the construction and maintenance in 1950 on a part-time basis as he worked for the Missouri-Pacific Railroad full time. He later became a full time employee and general manager after Hop’s death in 1960. Dave retired in June 1984. Dave’s wife, Lillian, worked in the business office in Collinston for many years also retiring in 1984. Mrs. Alton Norsworthy (Mrs. Dee) was secretary-treasurer for the company from 1956 until her retirement in early 1980. Mary Ann Harkness assisted in the commercial office from 1979 to 1987. In 1949, Congress authorized the Rural Electrification Administration (REA) to make loans to rural telephone companies who could not get reasonable funding from the banks for the construction or upgrades to the service. Northeast management operated on a shoestring budget for many years and they took every penny made from the telephone company and used it to purchase materials to expand and upgrade the system. With financial assistance from REA, many small companies were able to reconnect isolated areas and expand to new locations. In 1955, Northeast applied for and received funding for a loan from the REA to provide dial service to all of the subscribers located in Bonita, Jones, and Collinston. By 1957, the old manual switchboards were replaced with new Stromberg Carlson dial offices. All of the old “open wire” circuits were also replaced. Some of these “open wire” circuits were literally tacked on fence posts and sweet gum saplings. In 1956, a new business office was built next to the dial equipment office in Collinston and that building still serves as Northeast’s commercial business office today. Throughout the years with the help of the REA, telephone service has been extended to all rural subscribers and no area in the Company’s exchange boundaries is left unserved. Mike George, CEO/Chairman, Erin Jarrell, Secretary and Christine Sanders, Treasurer, serve as the officers for the corporation today. Many changes have occurred since the Company started operations. In the early 1950’s only 168 subscribers could afford or could be provided telephone service, but at the present time over 900 subscribers in the Bonita, Jones, and Collinston communities are served. In late 1968, IMTS mobile telephone service was added to the overall company service. This proved to be a valuable service to the area farmers. In 1982, Northeast Telepage was established by NortheastTel to offer personal paging capabilities throughout Morehouse Parish, which was not being served at that time. Through the utilization of antennae and tower placement in the Monroe, Collinston, and Bonita, subscribers were provided pager coverage for all of Morehouse Parish and portions of Ouachita Parish. In 1987, TV Northeast, Inc. was established by NortheastTel to provide cablevision service to Bonita, Collinston and the Bayou Galion area in Mer Rouge. Community support and subscription to this service was widely received. In 1993, a fiber optic toll (long distance) cable was buried between Bonita and Collinston connecting the two exchanges by NortheastTel connecting the exchanges in the South Central Bell network in Mer Rouge. This fiber optic cable provides quality digital long distance service to our subscribers. In 1995, NortheastTel began the first phase of a major replacement of equipment and cable which connected each subscriber with our office. The Collinston exchange was completed in June of 1996. The second phase of the replacement was completed in 1997 for the Bonita exchange. This construction provided sharp and clear service to our subscribers. In 1999, Internet services were added to NortheastTel’s family of offerings. Beginning with dialup services, customers were able to access the world from their homes and businesses in rural Morehouse Parish. In 2000, Northeast Long Distance made it easy for NortheastTel customers to make long distance phone calls at rates comprisable to national long distance providers while giving customers the convenience of having everything on one bill. In 2010, NorthesastTel started a three year construction project that converted all of our existing services over a 300 mile fiber optic ring that not only upgraded services for our existing customers, but also expanded our service area to the Horseshoe Lake, Holly Ridge, Little Missouri, and Cooper Lake Road areas. The upgraded services included converting to a digital television service that offers hundreds of high quality channel options, including local stations and premium channels. In 2014, the Siemens Stromberg Carlson digital telephone switching system was replaced by the Metaswitch VP2510 Integrated Softswitch. The new switch reduces power consumption, increases capacity capability, and adds support for the latest voice-over-IP (VoIP) technologies. In 2016, Rector Hopgood decided he was ready to retire and renew his interests in travel and recreational activities. The Norsworthy and George families took over his interests in the company to guarantee the company would remain locally owned. The officers and staff of NortheastTel are dedicated to improving the quality of life for our subscribers. Area residents have expressed the desire to have services usually available in large cities, but to also have the many wonderful amenities of small town life. At NortheastTel we all recognize the vital role that telecommunications and high speed broadband service will play in the continued development and support of our rural communities.